Savers with the Nationwide, the TSB, the Skipton and the Yorkshire Building Society will be among the first to benefit from the rise in base rates.The Yorkshire said all savers on variable rate accounts would receive the full increase of 0.25%.The same will apply to the Yorkshire's two other building societies, the Chelsea and Norwich & Peterborough.The Nationwide has already promised to increase rates by 0.25% for all those who received a cut in August 2016.Savers with TSB will see an increase of 0.15%. The bank said it was not passing on the full increase, as it had previously protected savers from the full 0.25% base rate cut in 2016.The Skipton said savings rates would rise by the full 0.25% from 5 December. Savers in the building society's cash Lifetime Isa will see the rate go up from 0.5% to 0.75% on the same date. 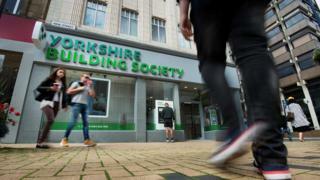 Mike Regnier, chief executive at Yorkshire Building Society, said: "It has been a tough few years for savers, so we're delighted to be able to pass on the full bank rate increase. "HSBC, Royal Bank of Scotland (RBS) and Barclays said they were reviewing their savings rates.Earlier Mark Carney, the Bank of England governor, said he expected all providers to increase returns for savers after the Bank's Base Rate was increased from 0.25% to 0.5%. "We do expect it to be passed on," he told reporters. "Banks did pass on the cuts to their depositors, and we expect competition to push it in the other direction. Obviously we will watch it closely." Borrowers with the Yorkshire Building Society will likewise see an increase in their standard variable rate (SVR) mortgages of 0.25% to 4.99%. SVR mortgage holders with the TSB and the Nationwide will also see a 0.25% rise.Most of those on tracker rates will see an immediate and automatic rise.HSBC said such borrowers would face higher borrowing costs from Friday. Lloyds Banking Group - which includes the Halifax and Bank of Scotland - said tracker rates would rise on 1 December.RBS - which includes NatWest - and Barclays also confirmed that tracker rates would go up, but neither have specified a date.Most lenders are expected to announce rises in variable rate mortgages over the next few weeks.However the Skipton Building Society said it had no plans to increase costs on its variable rate products.